A busy week for the St. Paul Academy and Summit School/Mounds Park Academy boys hockey team began on Tuesday evening after President Obama was sworn into office. The Spartans took on Como Park at the State Fairgrounds Coliseum, but it seems the players' minds were elsewhere, perhaps on the inauguration, as the Academy boys fell to the Cougars by a score of 5-4. The Spartans opened the scoring in the first period, as junior wing Wyatt Wenzel put the puck in the net at 11:17. The Cougars promptly answered back with a goal of their own just 44 seconds later by senior Max Paitich. Como Park then took the lead in the second period, but this time the Spartans answered back, this time with a nice shorthanded goal by junior center Luc Bruggeman, who put away a nice feed from Wenzel. Unfortunately for the Academy, Como still had time left on the power play, and just 11 seconds after Bruggeman's goal, Mike Heesch gave the Cougars a 3-2 lead. Steve Mantell scored just a few minutes later, putting the Cougars up by 2 going into the third period, which opened with another Mike Heesch goal just 18 seconds after the puck dropped. The Spartans tried to rally back, and came close, getting goals from senior wing Mike Falvey, and junior defenseman Sam Rock, but the rally fell short, and Heesch's second goal of the game proved to be the winner. After the disappointing loss to new Tri-Metro opponent Como, the Spartans needed to re-focus their energies towards their "Ford Parkway" rival, Minnehaha Academy on Thursday evening in Minneapolis. The Academy came out strong in this penalty-marred game (24 total infractions) that was to be decided on the special teams. There was only one first period goal, and junior wing James Adams scored it on a rebound as the Spartans took advantage of their first power play of the evening, jumping out to a 1-0 lead that would carry them through the first period. The second period began much the same, as juniors Wyatt Wenzel and Bryce Holstad each scored power play goals, putting the Spartans up 3-0. Minnehaha's Matt Wolpert scored the Redhawk's first goal of the evening, putting in a rebound off of Peter Knutson's shorthanded shot to get within two goals heading into the third. Knutson scored again just three minutes into the third period, this one, surprisingly, an even strength goal, that put undue pressure on the Spartans and senior goaltender Steven Estep in what, at one time, looked like a runaway victory for the Spartans. The Redhawks put 14 pucks on net in the third, but Estep only let Knutson's tally in, and the Academy held on to win 3-2, righting their listing ship as they headed into Saturday's game against the Saints. SPA got back on their home ice, hosting the St. Paul Saints in their third conference match up of the week. The Academy controlled much of the play in the first period, partly a result of the Saints missing two of the top scorers in the state in seniors Mike Anderson and Sam Wilczyk, but couldn't get any pucks past Saints goaltender John Bretzman, who made 15 saves, and the teams were locked in a scoreless tie at the end of the first period. It didn't take long, however, for Spartan junior Wyatt Wenzel to find the back of the net in the second period, as the Academy took a 1-0 lead on a power play goal after only 37 seconds had ticked off the clock. But Bretzman continued to keep the Saints in the game, energizing the team comprised of players from St. Bernards, St. Agnes, Concordia Academy, St. Croix Lutheran, and New Life Academy, but Spartan goaltender Steve Estep was up to the task, and the Spartans led 1-0 going into the third period. The Saints began the final stanza much like the Spartans began the second, solving Estep for a power play goal just 48 seconds into the period. The Saints took advantage of the momentum they garnered, taking a 2-1 lead a few minutes later on Zach Paul's even strength goal. The Spartans seemed to be shocked into action, as they proceeded to control play in the Saints zone, and finally senior Mike Falvey beat Bretzman, and tied the game at two. The Academy was persistent in their attack, and it paid off as Luc Bruggeman netted the game winner with 4:36 left to play, giving the Spartans a 3-2 victory. 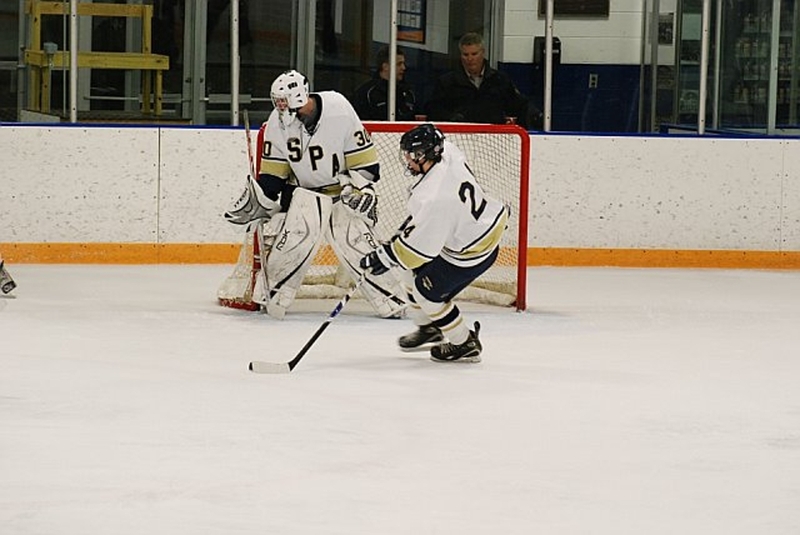 It's another big week ahead for SPA, as they travel to Phalen Arena to take on St. Paul Johnson, another new member of the conference, on Tuesday evening, and host The Blake School on Saturday afternoon at Drake Arena. Blake is currently second in the Tri-Metro standings, and Johnson is 4th. The Spartans are currently in third place, and look to maintain their position, and possibly move into second after these two big games.